The Church of Jesus Christ of Latter-day Saints has a four-fold mission: to perfect the Saints (members of the Church), to proclaim the gospel through missionary work, to redeem the dead through temple work, and to help the poor and the needy. 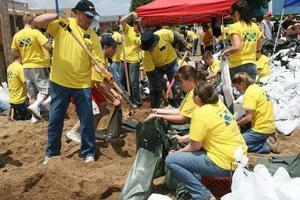 All faithful members of the Church of Jesus Christ are actively engaged in Mormon charity and charitable works. The first way in which Mormon charity works is Mormon donations in the form of Mormon Tithing. A tithe is defined as ten percent of one's increase, has been a foundational principle of God's chosen people from the beginning, and is found in the Bible in numerous locations. Thou shalt truly tithe all the increase of thy seed, that the field bringeth forth year by year. And thou shalt eat before the Lord thy God, in the place which he shall choose to place his name there, the tithe of thy corn, of thy wine, and of thine oil, and the firstlings of thy herds and of thy flocks; that thou mayest learn to fear the Lord thy God always (Deuteronomy 14:22, 23). And it came to pass that he commanded them that they should write the words which the Father had given unto Malachi, which he should tell unto them. And it came to pass that after they were written he expounded them....Bring ye all the tithes into the storehouse, that there may be meat in my house; and prove me now herewith, saith the Lord of Hosts, if I will not open you the windows of heaven, and pour you out a blessing that there shall not be room enough to receive it. And I will rebuke the devourer for your sakes, and he shall not destroy the fruits of your ground; neither shall your vine cast her fruit before the time in the fields, saith the Lord of Hosts. And all nations shall call you blessed, for ye shall be a delightsome land, saith the Lord of Hosts (Book of Mormon, 3 Nephi 24:1; 10-12). The principle was renewed in modern times with the restoration of the Primitive Church of Christ in preparation for His Second Coming. And this shall be the beginning of the tithing of my people. And after that, those who have thus been tithed shall pay one-tenth of all their interest annually; and this shall be a standing law unto them forever, for my holy priesthood, saith the Lord (Doctrine and Covenants 119:3, 4). In pioneer days Latter-day Saints often paid their tithing "in kind" by donating farm animals, grain and produce. Nowadays, tithing is paid with money or stocks (which are liquidated at their current value). 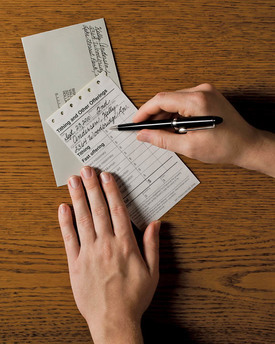 Most Mormon tithing donations are paid when a paycheck is received, but some Latter-day Saints pay yearly. This latter method is most desirable for those who are self-employed and really don't know what their income has been for the year until they do their final accounting in order to pay taxes. The paying of Mormon tithing is neither mandatory nor is it coercive. Tithes are offered confidentially. There is no collection plate passed around at church meetings, and there are no plaques in Mormon chapels denoting who has made a Mormon donation to pay for the building. It is true that temple attendance is reserved only for faithful Mormons, and that includes paying a full tithe, but the determination of who pays a full tithe is made by asking the person to declare whether he or she is a full tithe-payer or not. Therefore, it is completely on the honor system. There is no inquiry as to what a person is making in wages. Since the Great Depression in the Untied States, the Church of Jesus Christ has operated a remarkable welfare program that emphasizes self-reliance. LDS Church welfare is funded through Mormon donations called "fast offerings." Mormons fast for two meals the first Sunday of each month. They give the monetary value of those missed meals (and sometimes much more) to their local ward (congregation) for the care of the needy in their midst. Excess funds are then used for needs elsewhere in the Church of Jesus Christ. Mormon charity includes volunteering to make this program work. 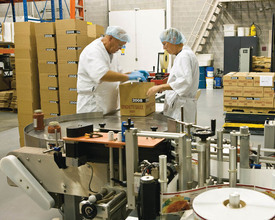 The Church owns orchards, farms, vineyards, ranches, and canneries where Mormon volunteers labor to put food on the shelves of Bishop's Storehouses, where the needy may obtain food with a voucher created by the congregational leadership (also provided by volunteers -- the Church of Jesus Christ has a lay clergy). Employment counseling and other helps are provided to help the needy improve their situation. During the 1980's, when there was starvation in Ethiopia, the General Authorities dedicated one Sunday's fast offerings from the worldwide church to alleviate the suffering there. They notified Mormons everywhere and asked for a generous Mormon donation. The fruits were $6 million. The Church of Jesus Christ is extremely active in the giving of Humanitarian Aid worldwide, both with disaster relief (immediate and with rebuilding) and many ongoing Mormon humanitarian projects. The LDS Church has a fund to which Mormons can make extra donations. Mormons also donate in kind, with church congregation auxiliaries mounting frequent humanitarian aid projects — putting together hygiene kits with donated materials, sewing quilts to send to disaster-stricken areas, and the like. Mormon helping hands are groups of Mormons who provide volunteer labor wherever it is needed for local clean up projects after storms, flooding or other local disasters, or just to provide help for the community. Mormons are the most volunteering people in the world. *Read more about Mormon Humanitarian Aid.